Trying to save money on your next vacation but also looking to splurge a little bit? With some forethought and following my cost reduction techniques on some big ticket travel items like airfare, accommodations and rental cars, you can save money on your next vacation to splurge on experiences. Here are my travel tips to save and enjoy spending on your next vacation. Looking to save a few hundred bucks on airfare? 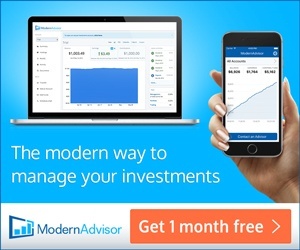 Check out skyscanner (no affiliate). This site is a metasearch site for all major airline carriers. 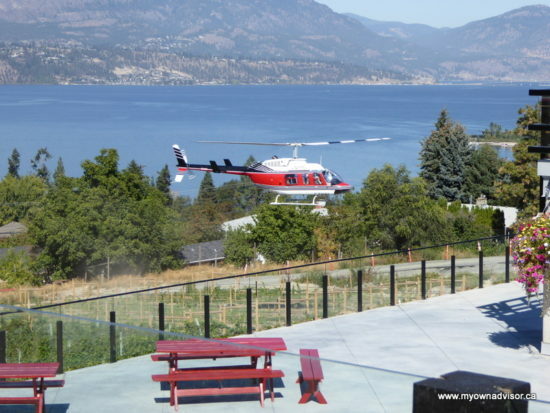 We recently used this site to get a good deal on our direct flights from Ottawa to Vancouver for our recent vacation. The navigation of this site is great and you can sign-up for automatic email notifications for price changes/drops. Unless you are fond of a particular flight time and route (which we are sometimes), I suggest you look for flight deals about 8 weeks out from your vacation. Try and fly on a Tuesday or Wednesday as well – you’ll get better airfare prices than travel on weekends. Another great site to save money on airfare? Try Chris Myden’s suite of sites – YOW Deals for us (no affiliate). Filter “From Other Cities” to find your departure deal. Although I’m a huge fan of cash back credit cards (I use one in particular consistently), I have in the past signed up for a few rewards cards to earn points for future hotel stays. After signing up and following the minimum spend criteria for this card, I once obtained 50,000 bonus points to go along with my existing rewards balance. We used those points to redeem four free nights at the Fairfield Inn in Kelowna (getting the fifth night free). 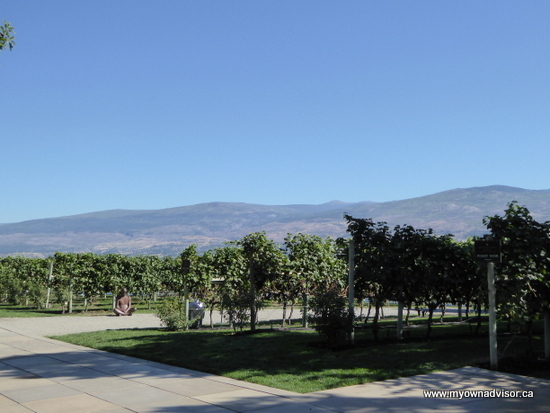 That effectively saved us about $1,000 in hotel accommodations for our recent trip to BC – money to splurge on great Okanagan Valley wine and food. We didn’t travel this way…but we did splurge on our rental…more in a bit. Don’t want to stay in a hotel? Don’t want to mess with hotel rewards cards? Try AirBnB (no affiliate) to save money. Thanks to Christine who rents out her brother’s lovely downtown Vancouver condo, we stayed in an upscale, centrally located 1-bedroom flat within walking distance of shops, restaurants, Granville Island, Stanley Park, great sushi bars and much more for less than $450 for our three nights. 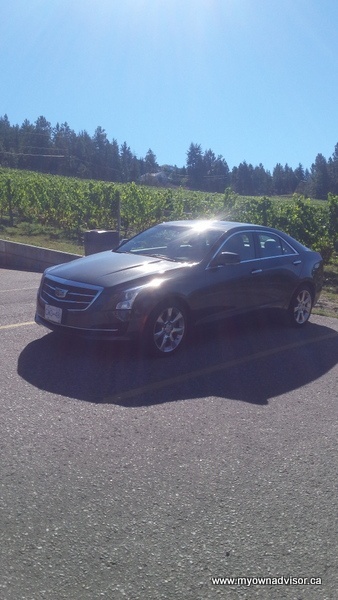 Our 6-day loaded Cadillac used throughout the Okanagan Valley cost us $252 taxes included. Saving money is good for vacations but saving money to splurge on experiences during vacation is even better. Thanks to some good deals from airfare to accommodations to rental cars, we splurged on fine food, evenings out, a great high-mountain experience on Grouse Mountain and sampled (countless) bottles of fine wine in the Okanagan Valley. 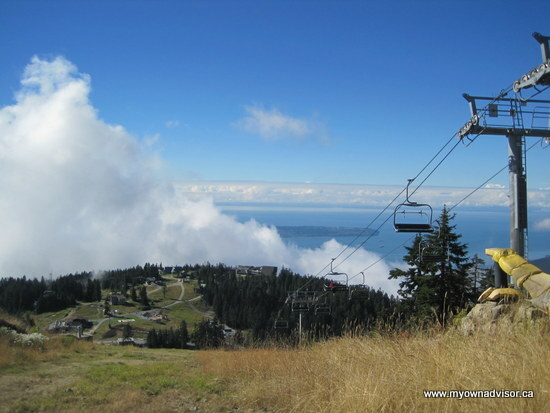 Chairlift ride up Grouse Mountain, Vancouver – 4,100 feet above sea level. Vacations are important to us. They deliver some valuable downtime away from the office, time away from day-to-day routines, and we enjoy quality time together. With some forethought and planning into big ticket travel items like airfare, accommodations and rental cars, we can afford to splurge on our vacation and not worry too much about the travel budget. Following my tips above I believe you can do the same – happy travels! What saving tips did you use for your last vacation? Did you splurge on anything when travelling? 14 Responses to "How to save and splurge on vacation"
Sounds like a great trip Mark and with some nice savings to boot. Always good to pack in as much as you can on vacation by doing your homework looking for best value. Fine job. I was looking for the BMW but I’m sure you enjoyed the Cadillac and a good deal for sure. Yes, Costco is good with car bookings although nothing like they used to be. They’re lousy for the US though in my most recent experience. My best was with Expedia. Last year I had a 3 day rental in Winnipeg booked through Costco- a Dodge charger $42 all in for 3 days. Can’t recall the rental co used. Skyscanner is excellent. Their site/engine has improved from a year+ ago. We’ve actually found our best flight prices through the cruise lines along with our ship booking, but only applies if you’re taking a cruise so limited for most travelers, and useless for domestic travel like yours. Bookings don’t need deposit and may be cancelled up to 2 mths before when payment is due. For example our next trip to LA, to Vegas, then back home was $1165 US = approx $1526. I tried Skyscanner but couldn’t get the same itinerary but very close. It was 15 minutes diff on the 1st flight, 1 hour diff. on the 2nd one, and the same flight returning home @ $1804 CDN so about $278 more. We did the same thing with our last Spain trip, using cruise co. I haven’t used Airbnb yet. For Spain I found better pricing and inventory on HomeAway and VRBO (Expedian co’s) but it likely varies by city/region/country etc. I gave up on hotel points plans years ago, but they can probably work like in your example. I often call hotels directly to try and get lower pricing than online, which works sometimes. I’ve been on Chris Mydens mailing list for about 5-6 years now. It’s worthwhile. Ha, I was looking for the BWM as well but they didn’t have any. Too bad. I was looking forward to driving the 328i around BC. Ah well. The caddy was very nice. We could have rented a lower-end car for about $200 taxes in for the 6-days, but then again, I figured what the heck? Might as well have a nice ride. We used Budget this time. Skyscanner is excellent – totally agree. I highly recommend Airbnb. I’ve looked at some places on VRBO for Portugal for next year. We’ll start saving for that in few months after the $11k is set aside for the TSFA of course! 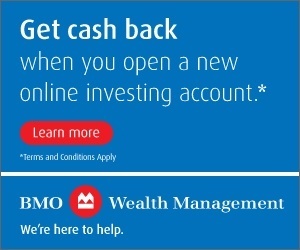 First things first with the TFSA savings and then on to vacation savings. Same deal here other than TFSAs have to be funded from RRSPs. As time goes on my travel agent cv is expanding. That’s a good thing! A GREAT thing! Happy planning indeed! We stayed at the same Marriott in the summer when we went to Kelowna. The breakfast lines were absolutely insane… we eventually opted for paying out of pocket and went somewhere else for healthier (less sugary) breakfast. Ha. Yeah. It was shoulder-season for us so the crowds weren’t bad. 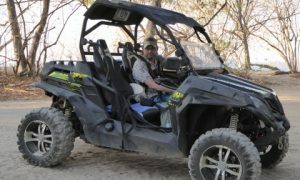 We also went during the week, it was quiet some mornings which was nice. Hey Mark, you just missed the royals at Mission Hill…. Good going with the hotel points. Years back I did some deal with Holiday Inn and got 3 bonus free nights, I used them at very expensive places (Calgary at the time, and 1 night in Vancouver) so received very good value, as the bookings that got me the free nights were done at inexpensive locations. Otherwise I don’t like hotel points as I don’t accrue them fast enough, last year one plan took away my points, when I had enough for a free night. BTW, I live just up the hill/mountain from where you stayed at the Marriott. I sometimes walk my dog along the creek behind that hotel. While I was in Ottawa a few weeks back I used AirBnB for the first time. I was alone and couldn’t see the point of paying a lot for a hotel, or staying really far out of downtown for a more reasonably priced place. I am used to the interior of Mexico where I get really nice places for $50 – 60 a night. It was a room in an apartment, and worked out well, as it was down the street from a friend’s place, so I could drink while having dinner with him–catching up after 25 years! The money I saved went towards an expensive meal with another old friend. Ottawa looked beautiful, but construction everywhere. I use google flights to search for airfares, supplemented by other searches when required. Hotel points are great but we don’t use them very often – only every few years. It takes us a few years to earn them up since we have a cash back card we use for most purchases. This way, I avoid any Air Miles headaches, etc. with them changing loyalty programs at will. Cash back is always good! Great to hear you had a good experience with Airbnb. We did as well. It’s a good business model really. “The money I saved went towards an expensive meal with another old friend.” Yes – nice to spend money on experiences. Construction is everywhere here, in the city, it’s a mess…getting ready for 2017 celebrations I guess! A site for International travel that I read about for vacation rentals is Wimdu. I have never used it myself but the article had said it works well. For flights we just used Flight Hub and got it cheaper than directly through the airline websites even though the payments were processed directly with the airlines. For timing and price we travelled Westjet one way and Air Canada the other. I never expected that to be cheaper. We still enjoy the B&B experience depending on where and when but we are a couple travelling so it can be easier than with a family. I never kept track of how many flights, hotel stays and upgrades we have enjoyed over the years due to loyalty programs that were accumulated through work travel so I know they are great in certain situations. I don’t get them near as often now but then I am home with my wife more too. There are always tradeoffs. Happy safe travels! Thanks for reading and this comment Duane. I’ve never hear of Wimdu. 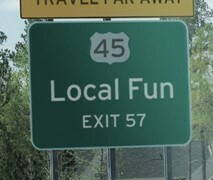 I will need to check that out. Flight Hub is great, Skyscanner aggregates flights from Flight Hub and more in an all-one-package. We’ve booked with Flight Hub via Skyscanner before. Oh man I love travel hacking!!!! So many people think they can’t afford to travel when in reality it’s just a matter of knowing where to find the bargains, A simple example, our flights this year we moved them back to September from summer (June/July) and prices dropped by a 1/3rd. This suits us well as we want to see the fall colours this year. I have no problem with travel hacking some, as long as it doesn’t impact our credit score and file.